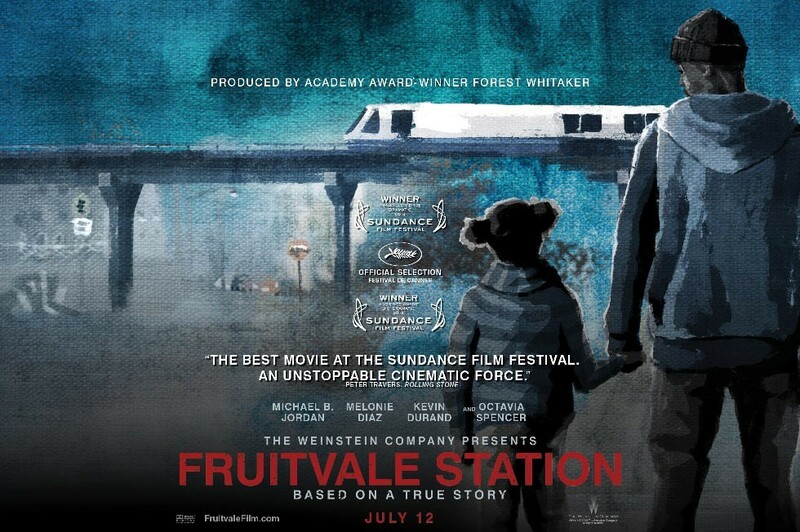 Fruitvale Station (2014) – Hooray For Movies!! Synopsis: The purportedly true story of Oscar Grant III, a 22-year-old Bay Area resident, who crosses paths with friends, enemies, family, and strangers on the last day of 2008. In the wake of the recent, and ongoing, riots and civil unrest in Ferguson, St Louis as a result of the fatal shooting of an unarmed black teenager, it felt timely and appropriate to watch Fruitvale Station; Ryan Coogler’s heartfelt eulogy to Oscar Grant who was murdered by BART (Bay Area Rail Transport) officers on New Years Eve 2009 in San Francisco. It was a story that gathered little attention in the UK, certainly compared to the recent events in Ferguson. It’s impact though was, and still is, acutely felt in and around the Oakland and Bay Area where his slaying led to riots and civil unrest, as well as sending serious shockwaves through the BART Police Department. Coogler, who also wrote the screenplay, opens with some cell phone footage of the minutes leading up to Grant’s murder as a packed train of New Year’s Eve revellers watch on in horror at the sight of BART Officers beating and manhandling a group of young black males. As things escalate a bang is heard, screams and cut to black. What follows is Coogler piecing together the last 24 hours in the life of a young man who, whilst no Saint, was ultimately a young father trying to provide for his young daughter and her mother. His choices may have landed him a previous prison sentence in 2007, but at 22 Grant was starting to turn his life around. Things were looking up and more than anything he wanted his 6 year old daughter Tatiana to grow up right. Coogler certainly doesn’t paint Grant as perfect. But by choosing to show the last 24 hours of his life Coogler makes a very clear statement; Grant was just a man. An imperfect one. A father. A boyfriend. A son. A friend. Someone who may have made mistakes but put others first and only tried to put food in his table. And who, regardless of his past, never deserved to be cut down in such a callous and heartbreaking manner. Unarmed, on the floor, shot in the back in front of a train full of strangers. The whole thing captured on film. It is a series of events and unthinkably poor decisions that in the absence of corroborating video evidence you may cynically think had been over egged. Coogler’s decision to show the video phone footage at the beginning I suspect was his way of removing any accusations of painting a subjective account of the events as Grant encounters friends, family and strangers during his last hours. At the centre of Coogler’s feature length debut is a tour de force performance from rising star Michael B Jordan, who will soon be playing Johnny Storm in the upcoming Fantastic Four reboot, and one that proves he is more than just a handsome face and million dollar smile. Jordan may take the plaudits but the gut wrenching sense of dread and loss that comes with seeing up close a sequence of events you know end in tragedy is in large part down to a raft of grounded, affecting performances from Melonie Diaz as his girlfriend and Octavia Spencer (The Help) as his Mother. The last 10 minutes of Fruitvale Station is like watching a train speed up towards someone and you have no choice but to watch as it plows straight into them. You want to step into the screen and intervene, tell someone of the tragedy that is about to unfold. When Coogler draws to the inevitably tragic conclusion you feel like you knew Grant and the sense of loss is profound. Sounds heart wrenching! It’s in someways wonderful that his last hours have been captured for at least several generations to witness as a human being trying as we all do in an unpredictable world, even though his life ended so tragically. It somehow might bring some comfort that he has passed on but is not forgotten…Looking forwards to watching it, thank you for another great review! A very sad movie, but at the end of, they at least show that a change can be made. Let’s hope it just doesn’t get trumped by even more police mistakes. Good review.